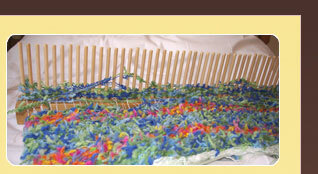 The peg loom enables you to produce weaving at a very satisfying rate with capacity for your own ideas and creativity. We have found it possible to weave on our own looms with a wide variety of materials from fine yarns to upholstery fabric. Even video tape and felting fleece can be used, each giving their own special textures.The same loom can be used to produce many very different but equally interesting textile effects. Whilst weaving, you can produce fabrics that are easy to make into accessories such as bags, belts, purses and even fur trims on the smaller sized looms. You can also produce rugs and throws using thicker fabrics if so desired. This can be achieved using the bigger sized looms. Also by using the larger looms, all of the smaller items can be created by using fewer pegs therefore resulting in different widths of weaving. There are absolutely no limits to what you can do! All our looms are 'Hand-Made in Yorkshire' to a very high standard and made from a beautiful hardwood called Tulip Wood. This hardwood has a truly stunning grain and gives character to the loom. They also have elongated pegs to make it easy to weave. Weaving on a loom is a very easy process and full instructions are despatched with the looms. Also any enquiries, assistance, queries or orders are welcome by email or by calling 07575 812171 (anytime) . The looms come in a textile bag and are supplied with a full set of pegs and we also provide spares. Again, if you require more spare pegs then please contact us with your request. We also supply the white thread which is used to get you started. Good luck and happy weaving! Weaving on a loom is a very easy process and full instructions are despatched with the looms. Also any enquiries, assistance, queries or orders are welcome by email or by calling 07722 940749 (anytime) .